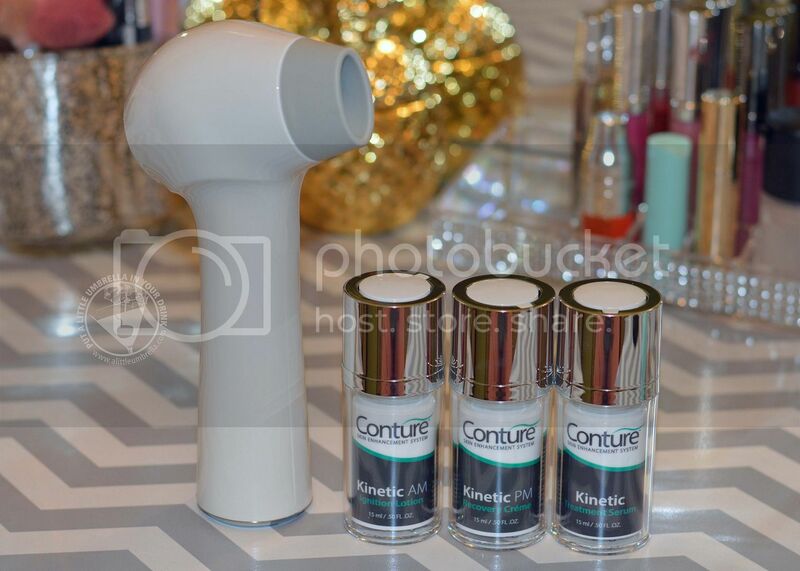 A few weeks ago I told you about the Conture Kinetic Skin Toning System. Now that I have tried for several months, I am back to tell you that I love this product. I also want to share how to use this skin toning system. It is easy and painless. 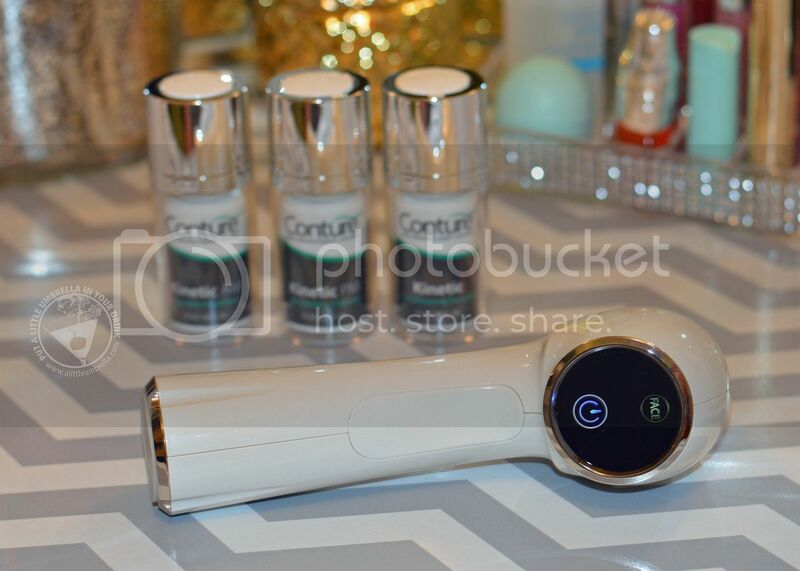 Like I mentioned, I am so happy with the Conture Kinetic Skin Toning System. It does not hurt at all. In fact, it feels kind of good ... like a spa treatment. The unit has a small area that makes a small tugging motion and releases it quickly. No pain whatsoever. Results? Yes! You can expect to see results like the Conture before and after photos shown above. The biggest difference for me was in pore size reduction and a smoother skin tone. I am not quite at the age yet where I would see any wrinkle smoothing, but I will keep on using the Conture to hopefully make that less of an issue! So how do you use thing? Conture works best on a clean skin surface, so make sure to cleanse your face thoroughly before use to get your ultimate skin rejuvenating results. 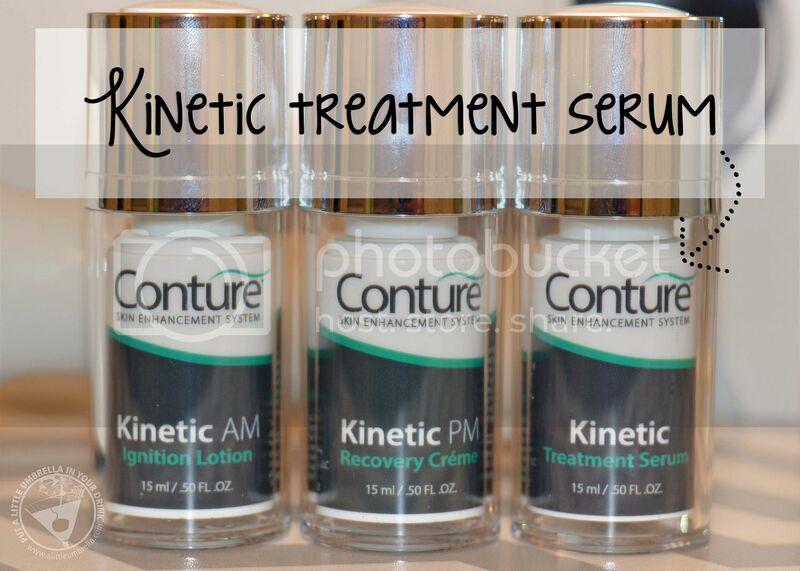 For best results, apply a pea-sized amount of the Kinetic Treatment Serum to each desired treatment area every time you use the Conture Device. Press the power button on the back of the device and choose the best mode or your focus area. “FACE” is the default setting and works for most focus areas. Slowly glide the device upwards in an arch from the lower brow to the area near the hairline, gliding the device approximately every 3-5 pulses, or a maximum of 5 seconds before each glide. Repeat this as many times as needed to fully cover treatment area. TIP: Ensure Treatment Head is firmly pressed against the skin to create a vacuum seal. Complete your treatment by applying either the Kinetic AM Ignition Lotion, or Kinetic PM Recovery Crème, and/or your own desired lotion or crème. 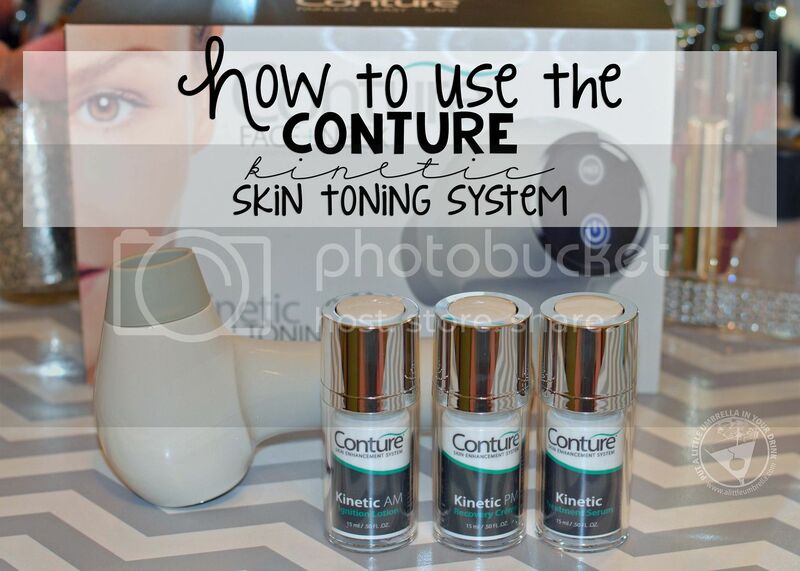 Maintain the look and feel of toned skin with continuous use of the Conture Kinetic Skin Toning System. 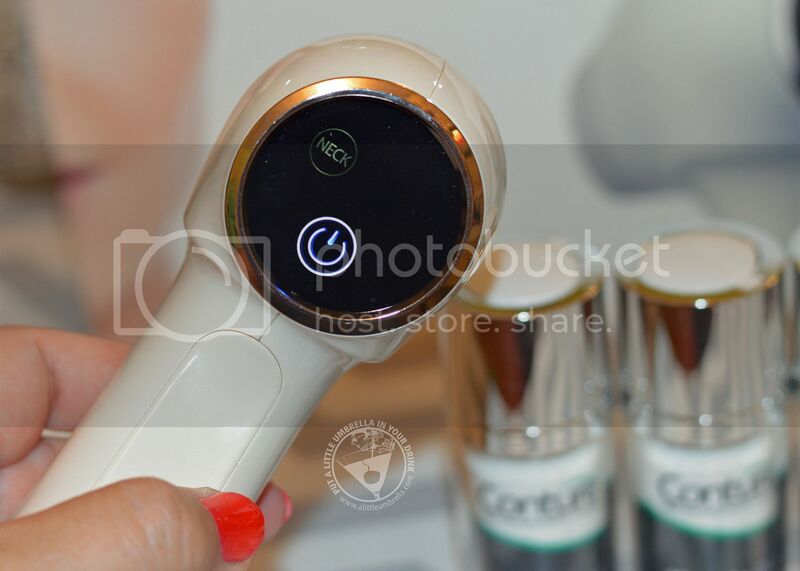 Although this skin toning system is on the pricey side at $300, I still think it is worth it. It is so easy, painless, and safe to use. You can use the code UMBRELLA20 to receive 20% off your order. 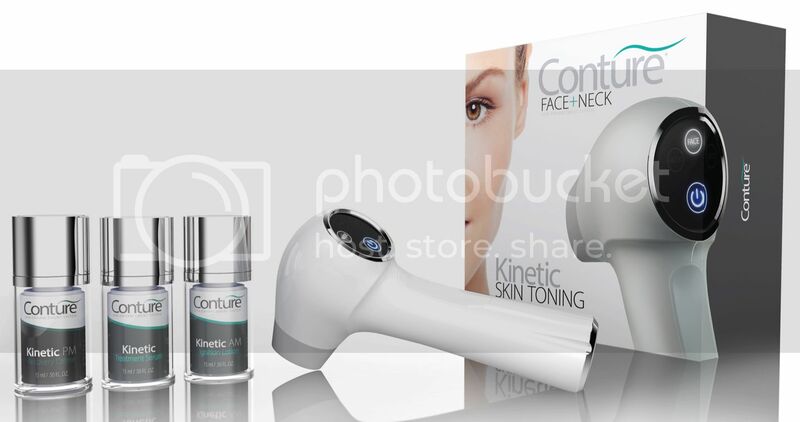 Connect :: Visit conture.com to learn more about the Conture Skin Toning System. You can also connect with Conture on Facebook and Twitter.